It is several weeks after the holiday season of 2013 and I’m wondering if any of my readers have put on some pounds. I know for sure I have and I’m not too happy about it. Every year it seems like I’m on a good pace and have lost some weight over the summer and fall and then I pack on some pounds during the holidays. It’s so hard not to with all of the delicious food, drinks, and snacks. Not to mention the chocolates, cookies, and cakes that seems to keep appearing on my kitchen counter. It all begins with Thanksgiving and ends with our New Years Eve dinner. Well maybe a couple of days after that because we still have leftovers to deal with. Then come the New Years resolutions to lose the weight again such a vicious cycle. Well setting my frustrations aside I have once again decided to live a healthier lifestyle as a resolution for 2014. Part of me maintaining this lifestyle will be to monitor my progress using a scale to measure my weight. My old scale would definitely need replacing since it wasn’t too accurate. 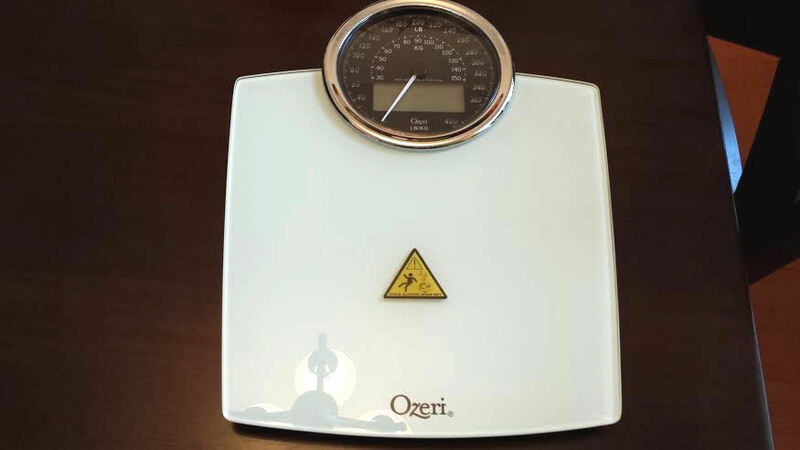 We were recently given an Ozeri Bathroom Scale that has a digital display and electro-mechanical weight dial. 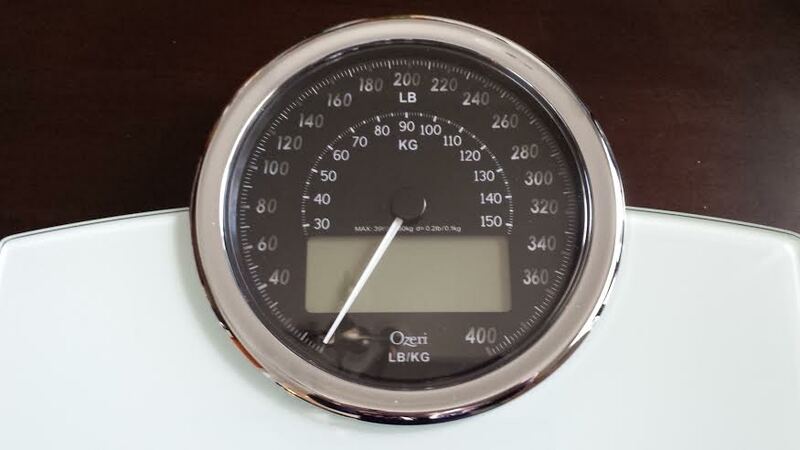 The electromechanical dial and digital display lights up when you stand on the scale and can read your weight in pounds or kilos. The display is large enough to read with out having to squint, or bend over. It also has a built in alarm that can be activated to remind you every day to weigh yourself. Yah like I want to be reminded to step on the scale. But I guess some people do. For example I was tracking my weight loss during my 14 days challenge with Slimfast. Take a look at my results and find out how many pounds I’ve lost. 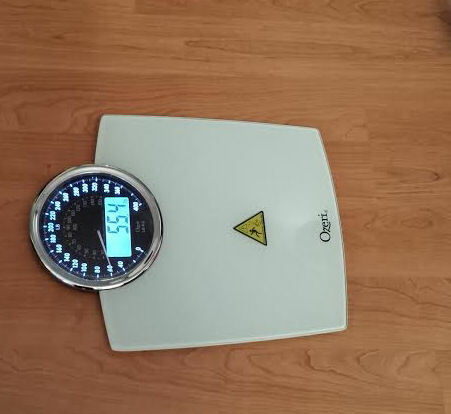 As you can see by the photo the Ozeri Bathroom Scale is very sleek and thin in design. To me it has a modern look and would look good in any bathroom. I really like the way this scale functions and is designed. The fact that it lights up is great especially in the morning when I don’t want to be showered with light in the bathroom. It also flashes your weight three times to register the most accurate weight when it the measurement is done. Once you step off the scale your weight stays on display for another 10 seconds. That way you don’t have to sit there and stare at the scale waiting for the needle to settle. After 10 seconds the display shuts off completely to save the battery power. It also makes a cool noise, which is difficult to describe. Guess I just like it since it makes you feel like something is happening. Well I have to say I’m not looking forward to all of the work I need to put in to lose my holiday weight but at least I will have an accurate scale to help me track my progress. My Ozeri scale will also become handy when I weigh the luggage. Bottom line: the Ozeri scale has a very attractive sleek modern design, the surface is shiny, it is very easy to use and read, it is sturdy, it comes with batteries and reasonably priced at $29.95. This product is currently sold on Amazon. 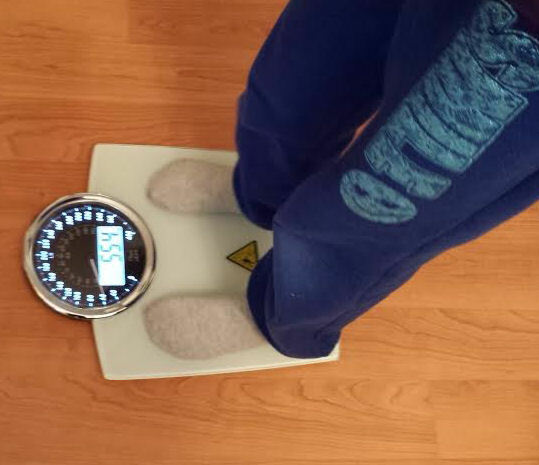 Disclosure: I was given a sample Ozeri Bathroom scale for free for review purposes and to inform this content. No compensation was received. All opinions are mine and mine alone.